Any time we can split a paddock for sheep with five rolls or less we use ElectroNet. Click here to see Premier’s “How to install ElectroNet” video. The whole fence can be carried out to the paddock in one trip. It can be set up quickly with out the need of any tools. The posts are built in so there is no questions on how far apart they should be and easy for any size person to get the right tension on the fence. Sometimes you will find that the grass is tall enough that it is hard to set the net up and push in the posts. A simple solution to this is to drive your ATV (see photo below), truck, or even a garden tractor down the path where you want the fence to be. Then set the net up in one of the tire tracks. Two or three Powerposts for extra support at the corners, a PowerLink to connect to a hot wire. Test the fence with a fence tester and make sure the voltage is above 3000 volts and turn in the sheep. Unrolling a roll of net after a path has been made by an ATV. A major benefit of electrified netting is its ability to be set up just about anywhere. This versatility is extremely helpful in the weeks leading up to winter feeding. How so? Every day you are able to extend your grazing season is a day that feed does not have to be bought in. Netting allows the user to graze areas that are “missed” by others. 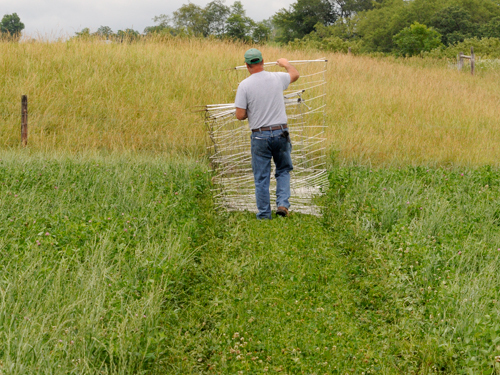 The grassy corner in the corn field, the brushy area by the pond or the steep bluff can all be fenced with netting and subsequently grazed by the flock. So take a look around your farm and see what you’ve been missing. from Premier’s April/May 2007 Newsletter.